Meatballs are a typical finger food found at most parties and we have created a delicious recipe for ’em that are sure to please! 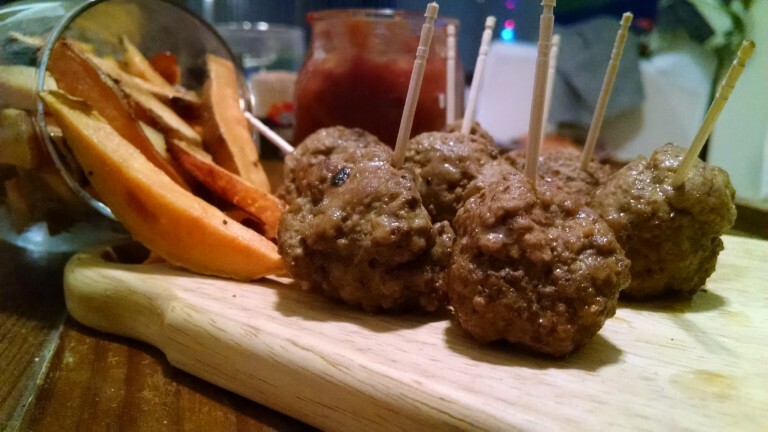 These meatballs pair well with our Blitz sauce (recipe to come) or go crazy with a curry sauce. Either way, these little spheres of meaty goodness are packed with protein and are a quick, easy snack food for even the pickiest of eaters. **To feed 4 people, use 1 1/4 pounds; to feel 12 you will need closer to 2 pounds. In a large mixing bowl combine the lamb, cumin, ginger, and a pinch of both salt and pepper. Mix well. To make individual meatballs, roll a small serving of the meat mixture about the size of your inner palm into small balls. (They will shrink as they cook). Set aside on a plate. Once all the meat has been formed into balls, cover the plate with plastic wrap and cool in the fridge for an hour. Melt 1 tablespoon of ghee into a large skillet over medium to medium-high heat. Once melted, add in the garlic and sauté until golden brown, but not burned. (The garlic will flavor the skillet and add a delicious depth of flavor the meatballs, which will also get cooked in the same skillet). Add in the remaining tablespoon of ghee if necessary and the refrigerated meatballs into the skillet. Stir or turn the meatballs frequently so they brown evenly on all sides (about 3-5 minutes). Reduce heat to medium-low and place a lid on the skillet. Let the meatballs cook for an additional 10 minutes. As needed, test the meatballs’ doneness by gently cutting one open, checking for pinkness. Finally, throw the finished meatballs in a bowl or on a serving plate (leaving out the minced garlic) and place toothpicks in each one for presentation. (Or not. We don’t judge.) Serve with your favorite dipping sauce or condiment!